Ballinrobe in Ireland-West is a perfect choice for a great holiday or a fun short break in County Mayo. Find out more about Ballinrobe below. 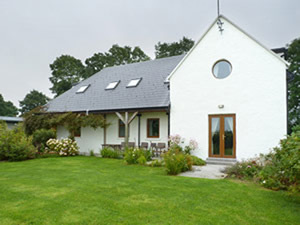 A beautiful country home, within easy reach of Westport, Croagh Patrick, the Atlantic coast and Connemara. Relaxed and comfortable with internet, its own vegetable garden, lawns & lovely views. ThereÃ‚â€™s a welcoming open fire, with fresh eggs and home-made bread on arrival. For cyclists and walkers the Greenway track and Wild Atlantic Way are thirty minutesÃ‚â€™ drive. For fishermen, golfers and racegoers there are stunning loughs, an 18 hole golf course and the worldÃ‚â€™s most beautiful race course on your doorstep. The house and gardens are ideal for children, and we welcome pets.Shop. Pub. Restaurant 3 miles. Beach 20 miles. Beach 3 miles. GF: lounge/kitchen/diner, utility room, double, w.c. FF: 2 double with singles, triple, bathroom, shower room.Electricity and oil central heating included, open fire with starter pack, linen and towels included, aga style stove, cot, high chair, travel cot, stair gate, TV, dvd player, freezer, microwave, dishwasher, underfloor heating, w/machine, dryer, internet access, hairdryer, welcome pack, fully enclosed garden, garden furniture, private off road parking. Pets welcome. Ballinrobe is family friendly self catering. We have the following details listed regarding Ballinrobe accommodation accessibility but we would recommend that you always confirm these prior to booking with the owner or operator. Ballinrobe is a great base to explore the wonders of County Mayo and you will find plenty of activities near by. Ballinrobe is at Lough Mask, County Mayo. Check out the map below for directions, use the controls to zoom in. If you have stayed at Ballinrobe why not add your thoughts, comments, pictures to our Facebook page? Don't forget to add the name/town/page link to your comment so its attributed to the correct place. Please keep it polite, we are sensitive souls! Find Cottage Holidays works closely with independent cottage owners and leading holiday travel operators to provide you the widest choice of self catering accommodation across Ireland. Ballinrobe in County Mayo is available through: Imagine Ireland.